(Smith and Kraus, Spring 2007). 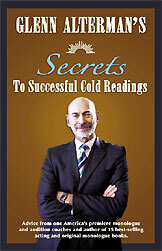 Work on developing your cold reading skills for theater, TV and film auditions. Learn how to scan material and make quick, personalized choices. Actors can either bring in material or Glenn will provide material for each session. All aspects of auditions (theater, film, agents office) are covered, from entrance to exit. All sessions are payable by cash or money order, payable in advance and are not refundable. Any credits will be applied to future sessions. Cancellations require a 24 hour notice for students not to be charged for a session. All packages are good for one year.